A group of strangers take shelter from a storm in an old house only to find themselves hunted down by a collection of dolls, from old-fashioned china dolls and porcelain dolls to dolls that talk and move. 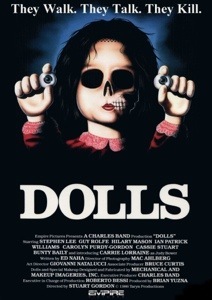 Written by Ed Naha 1987’s Stuart Gordon’s Dolls remains creepy and scary and is certainly not for viewers with a pediophobia. Fuzzbee Morse’s great score is atmospherically fitting with its melodic cues and stings there’s also a touch of 80s synthesiser thrown in. The set design and locations set up the eeriness from the outset. Mac Ahlberg’s cinematography coupled with Gordon’s old school camera tricks and some fantastic blood, gore and practical special effects from an array of craft masters sell the horror. Watching the unsavoury characters getting picked off one by one, meeting their demise is horror fun throughout. Choppy continuity and a spate of dodgy acting aside Gordon’s offering for the most part is excellent. The tone is more oppressive than that of Charles Band’s PuppetMaster (who was also one of the producers on Dolls) and those familiar with Brian Yuzna’s horror work will notice his producer touch on the production. Even though some optical effects and Dave Allen’s stop motion has dated slightly they still add an uneasy air to the proceedings. The death scenes are effective and credit to the special effects team when it’s revealed what’s under the dolls it’s enough to send shivers up and down the spine. Amongst the dark corridors, antique furnishings, storms and lightening there’s a handful of standout scenes, Hillary Hartwicke with a pram; killer toy solider death squad; Teddy bear attack to name a few. Aside from Mr. Punch and Teddy the dolls act as more of a collective. With some dark humour perfectly cast Hilary Mason’s (no stranger horror roles including Don’t Look Now and The Haunted) timing and subtle delivery as the old woman Hartwicke is outstanding. Carrie Lorraine’s Judy, an imaginative little girl is very effective. Stephen Lee’s (Robocop 2) innocent Ralph fits the part in contrast to Guy Rolfe spooky character(who would later play Toulon in Puppet Master 3 to name a few) is on fine form. A recommended moralistic adult fairytale highlighting that being a parent is a privilege not a right.